The teaching materials for the learning experience on “The Restoration” are divided into three parts. Part 3 includes a practice exercise that will help students apply the doctrine they learned from the Doctrinal Mastery Core Document, along with the doctrinal mastery passage found in Doctrine and Covenants 135:3. This lesson also includes a cumulative review of all the doctrinal mastery passages students have studied so far. Note: You could teach the practice exercise and cumulative review in this lesson in a single class session or in two separate class sessions. If you choose to teach the segments over the course of several class sessions, you may need to briefly review with students what they learned in previous segments before you teach a new segment. Note: You may want to adapt the following scenario according to your students’ experiences and needs. Divide students into groups of three, and assign each student in the group one of the three principles from the “Acquiring Spiritual Knowledge” section of the Doctrinal Mastery Core Document: act in faith, examine concepts and questions with an eternal perspective, and seek further understanding through divinely appointed sources. Ask each student to read the paragraphs for their assigned principle, looking for information or concepts that would be helpful when responding to this family member’s question. After sufficient time, ask students to take turns reporting what they find. Invite students to review Doctrine and Covenants 135:3 and the key statement of doctrine it helps teach in paragraph 4.3 in the Doctrinal Mastery Core Document. In the preface to the 1830 edition of the Book of Mormon, Joseph Smith wrote: “I would inform you that I translated [the book] by the gift and power of God” (see also D&C 135:3; the title page of the Book of Mormon). “Whatever the details of the process, it required Joseph’s intense, personal efforts along with the aid of the revelatory instruments” (Neal A. Maxwell, “By the Gift and Power of God,” Ensign, Jan. 1997, 39; see also The Joseph Smith Papers, Documents, Volume 1: July 1828–June 1831, ed. Michael Hubbard MacKay and others , 84). Joseph Smith’s principal scribe, Oliver Cowdery, stated that by “looking through” the Urim and Thummim, Joseph “was able to read in English, the reformed Egyptian characters, which were engraved upon the plates” (A. W. B., “Mormonites,” Evangelical Magazine and Gospel Advocate 2 [Apr. 19, 1831]: 120). Some later historical accounts indicate that Joseph Smith sometimes also used another instrument while translating the Book of Mormon. This was a small oval stone, referred to as a seer stone, that he discovered several years before he obtained the golden plates. These accounts indicate that Joseph would sometimes place either the interpreters or the seer stone into a hat to block out light, which allowed him to better see the words that appeared on the instrument (see Richard E. Turley Jr., Robin S. Jensen, and Mark Ashurst-McGee, “Joseph the Seer,” Ensign, Oct. 2015, 49–54). “Why do we not have more disclosure concerning the process of translation of the Book of Mormon? Perhaps the full process was not disclosed because we would not be ready to understand it, even if given. Perhaps, too, the Lord wanted to leave the Book of Mormon in the realm of faith, though it is drenched with intrinsic evidence. After all, Christ instructed Mormon, who was reviewing the Savior’s own teachings among the Nephites, not to record all of them on the plates because ‘I will try the faith of my people’ (3 Ne. 26:11). Perhaps the details of translation are withheld also because we are intended to immerse ourselves in the substance of the book rather than becoming unduly concerned with the process by which we received it” (Neal A. Maxwell, “By the Gift and Power of God,” 40–41). How could the doctrine and information taught in these sources be helpful in responding to your family member’s question? To give students an example of how someone could respond to a question like that in the scenario, provide each group of students with the accompanying handout. Carefully read President Uchtdorf’s response. “I answer, ‘Yes! That is exactly what I believe.’ This was done as Joseph said: by the gift and power of God. “In reality, most of us use a kind of ‘seer stone’ every day. My mobile phone is like a ‘seer stone.’ I can get the collected knowledge of the world through a few little inputs. I can take a photo or a video with my phone and share it with family on the other side of our planet. I can even translate anything into or from many different languages! 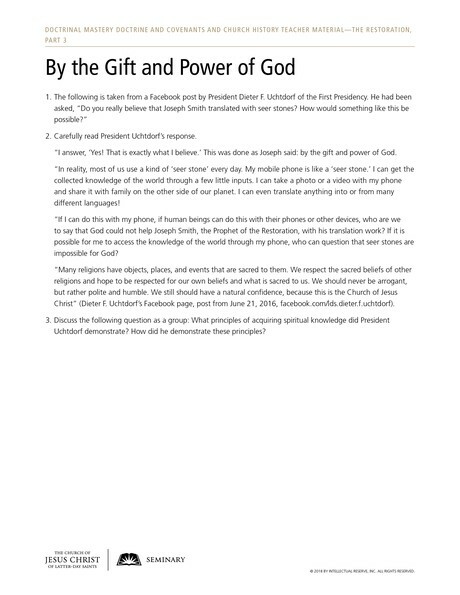 “If I can do this with my phone, if human beings can do this with their phones or other devices, who are we to say that God could not help Joseph Smith, the Prophet of the Restoration, with his translation work? If it is possible for me to access the knowledge of the world through my phone, who can question that seer stones are impossible for God? “Many religions have objects, places, and events that are sacred to them. We respect the sacred beliefs of other religions and hope to be respected for our own beliefs and what is sacred to us. We should never be arrogant, but rather polite and humble. We still should have a natural confidence, because this is the Church of Jesus Christ” (Dieter F. Uchtdorf’s Facebook page, post from June 21, 2016, facebook.com/lds.dieter.f.uchtdorf). Discuss the following question as a group: What principles of acquiring spiritual knowledge did President Uchtdorf demonstrate? How did he demonstrate these principles? After sufficient time, invite several students to report what they discussed in their groups. Divide students into pairs and give them each an opportunity to practice responding to the family member’s question in the scenario above. You may want to conclude by testifying that Joseph Smith was called to be the Prophet of the Restoration and that he translated the Book of Mormon by the gift and power of God. Encourage students to use the principles of acquiring spiritual knowledge when they interact with people who have questions and also to strengthen their own testimonies. Invite the students to read their scripture and choose two key words that could serve as descriptive clues. After sufficient time, invite the students to stand up and move around the room, asking other students for their key words. Using their Doctrinal Mastery Reference Guide, students should try to identify all 12 scripture references by talking to different students in the class. You could allow students to write their initials next to each reference correctly identified until they have found all 12 references.